Location: South of the A6 at Blackwell Mill. Close to the beginning of the Monsal Trail. There is no road access. 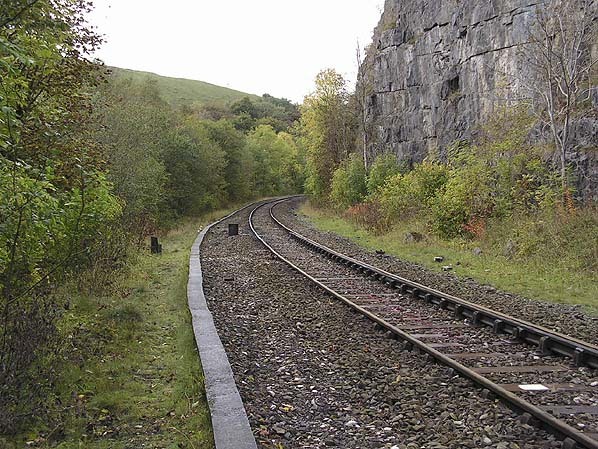 Notes: Cheedale Halt was located on the Peak Forest Junction to Buxton Junction spur of a triangle of former Midland Railway (MR) lines at Blackwell Mill. The spur was the only surviving part of the triangle which was at the southern end of the MR’s Blackwell Mill to Chinley line that had opened on the 1st February 1867. 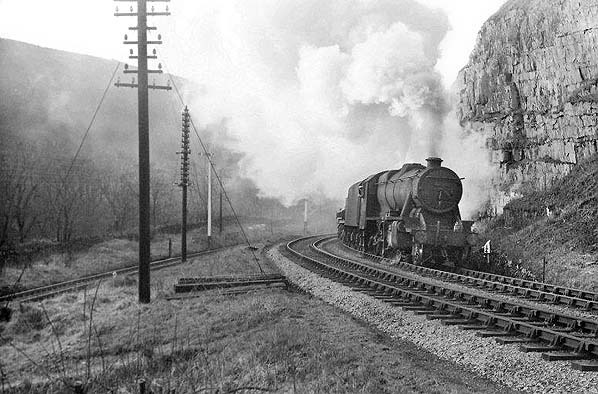 The southern edge between Buxton Junction and Millers Dale Junction had closed in 1967. 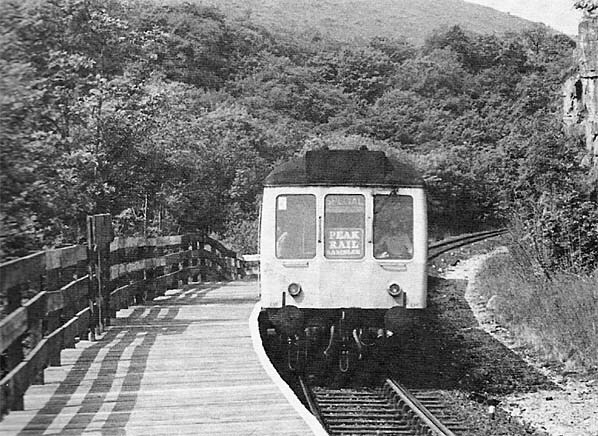 The eastern side between Millers Dale Junction and Peak Forest Junction had closed in 1968 along with the MR line to Matlock. The western side of the triangle had survived the closures of the 1960s as a freight line that connected Buxton to Chinley. Cheedale Halt was opened by British Rail on the 5th July 1987. The halt had been promoted by Peak Rail who had a base at the site of Buxton Midland Station and an ambition to re-open the line from Buxton to Matlock. Peak Rail had been given a grant from the Greater Manchester County Council just before it was abolished on the 1st April 1986. The grant was for £30,000 and it was given so that a bridge could be replaced at Buxton and so that Cheedale Halt could be built. Cheedale halt was built to serve a Ramblers train service that operated between Edale and Cheedale. The service was called the ‘Peak Rail rambler’. The halt was adjacent to the Monsal Trail a long distance path that follows the route of the former MR towards Matlock. The trail had opened in 1982 and had become very popular with Ramblers. Cheedale Halt consisted of a timber built single platform that was located on the east side of the line, which had become a single track at this point by 1987. The Halt’s nameboards were in a heritage style reflecting station signs of the BR period in the 1950s and 60s. The passenger train service operated for only one summer season. It ran on 12 Sundays and on the August Bank Holiday Monday of 1987. The Health and Safety Executive raised concerns about the signaling along the line as they felt that it was not adequate for passenger services. They informed BR that the signaling would have to be upgraded. BR felt that upgrading the signaling for a Sundays only summer train service was not worth the cost. Cheedale Halt closed to passenger services after the last train left on the 13th September 1987. The halt remained in situ for a number of years after closure. It was certainly still extant in 1989. 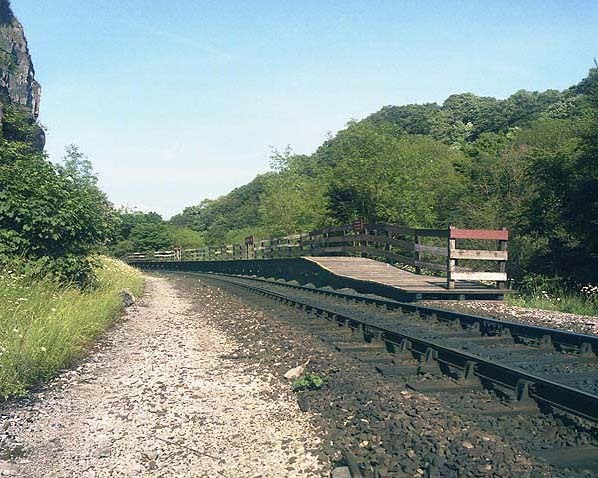 In the early 1990s Cheedale Halt was dismantled and taken to Matlock where it was re-erected on the Peak Rail heritage line as Matlock Riverside station. No trace remains of Cheedale Halt today apart from a little timber from the end of the west ramp. The line is still open for freight services. Sources: Rail Enthusiast ‘Magazine’ October edition 1987. Railway World ‘Magazine’ March edition 1988. Looking south west on the 5th July 1987 as a two car class 108 DMU pulls into Cheedale Halt. This was the first day of train services which would only last for seven weeks. The train service was run in conjunction with Peak Rail as a way of promoting the line to Ramblers. Photo by Sheila and David Barratt from Railway World Magazine March 1988 edition. Looking towards the west at the site of Cheedale Halt in October 2009. The sections of timber sticking up out of the ground mark the position of the station's ramp at its western end. The line which had originally been double track is still open for freight trains that serve the many quarries that are located in this area. Buxton Junction, where this line would have joined the line from Millers Dale Junction was located out of sight of this picture just around the corner to the right of the rocky outcrop.